PT Gedhis Multi Manis - PT GMM is a reputable company in Indonesia, running business in sugar industry. 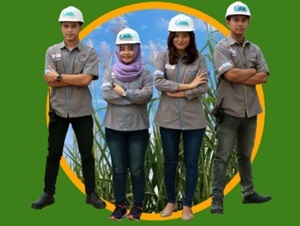 PT GMM is based in Blora Central Java and engaged in industry, trading and services of sugar. PT GMM is the first sugar cane based factory built in Indonesia for the past 35 years, since 1982 and commissioned in mid-2014. PT GMM operates operates primarily as a producers of white sugar with its sugar factory in Tunjungan Todanan Blora Regency, with a total production capacity of 4,000 tons of canes per day (TCD) expandable to 6,000 TCD and 600 tons per day for raw sugar. PT Gedhis Multi Manis is a member of Perum BULOG, a well-established state-owned food logistics company in Indonesia. Perum BULOG acquired PT Gendhis Multi Manis in 2016. According to information found in Perum BULOG Annual Report 2017 as cited by JobsCDC,com, Perum BULOG holds 70% shares in PT Gendhis Multi Manis (as of December 2017). Other 30% remaining shares in PT GMM was owned by PT Pandu Agro Nusantara. Male/Female, age around 22 - 35 years old. S1 Department of General Medicine. Minimum TOEFL score of 450 / TOEIC 470. S1 Department of Law Science / Law. Male, age around 22 - 35 years old. D3/S1 Department of Electricity Engineering. D3/S1 Department of Electronics Engineering. D3/S1 Department of Mechanical Engineering. D3/S1 Department of Industrial Engineering. D3/S1 Department of Chemical Engineering. D3/S1 Department of Civil Engineering. JobsCDC.com now available on android device. Download now on Google Play here. Please be aware of recruitment fraud. The entire stage of this selection process is free of charge. PT Gedhis Multi Manis - D3, S1 Fresh Graduate Program BULOG Group November 2018 will never ask for fees or upfront payments for any purposes during the recruitment process such as transportation and accommodation.